No matter what you need it for, if you’re in the market for a durable carbine hook with screw nut, you’ve come to the right place by visiting Rope Services Direct. Also called a Karabiner, this type of fixing has a flexible closure which when shut is secured tightly using a small nut. Perfect for use both leisure settings and for industrial projects where being safe is essential. Manufactured using marine strength stainless steel, our carbines are excellent when used both indoors and outdoors. This not only allows them to be both weather-proof and anti-rust, it provides solutions in a broad spectrum of things such as parascending, water sports and climbing. Locking carbines are almost identical in appearance to ones which don’t lock, but with an additional piece to protect the gate. This is then held in situ by turning the screw so the carbine can’t be opened unintentionally, for example due to being hit against something. We are pleased to offer a massive spectrum of carbines for every need from our large warehouse close to Birmingham. Whatever your intended application or use you are sure to find a perfect carbine hook on our website. To make your purchase, just complete a rapid order e-form here on our contact page. Or if you want to talk with us, just give us a call today by dialling 01384 78004. 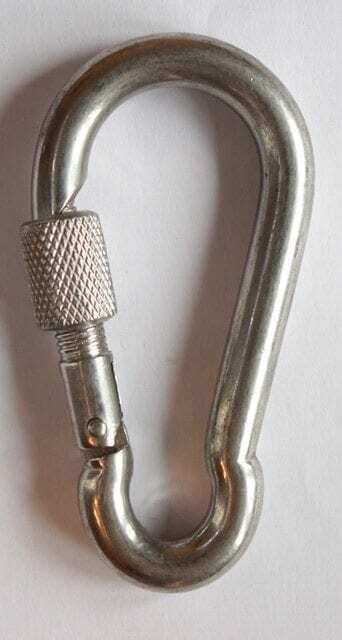 Carbine Hook with Screw Nut Overall rating: 5 out of 5 based on 6 reviews.